Protein isoforms, or "protein variants" is an ambiguous term describing either several different forms of protein coded from the same gene, or proteins with amino acid sequence and functional similarities, even when they are products of different genes. Through RNA splicing mechanisms, mRNA has the ability to select different protein-coding segments (exons), or even different parts of exons from RNA to form different mRNA sequences. Each unique sequence produces a specific form of a protein. Among all RNA splicing mechanisms, alternative splicing is the most predominant one which is responsible for most of protein isoforms. The discovery of isoforms could explain the small number of protein coding regions genes revealed by the human genome project: different proteins encoded by the same gene could increase the diversity of the proteome. Isoforms at the DNA level are readily characterized by cDNA transcript studies. 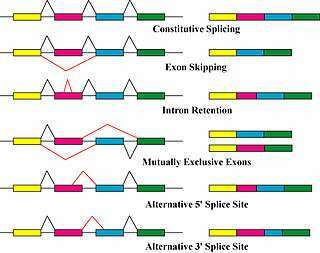 Many human genes possess confirmed alternative splicing isoforms. It has been estimated that ~100,000 ESTs can be identified in humans. Isoforms at the protein level can manifest in deletion of whole domains or shorter loops, usually located on the surface of the protein. One single gene has the ability to produce multiple proteins. All these proteins are different both in structure and composition and this process is regulated by alternative splicing of mRNA and have a large impact in proteome diversity. The specificity of produced proteins is derived by protein structure/function, development stage and even the cell type. It becomes more complicated when a protein has multiple subunits and each subunit has multiple isoforms. In human skeletal muscle, the preferred form is α2β2γ1. But in the human liver, the most abundant form is α1β2γ1. Different mechanisms of RNA splicing. Alternative splicing is a post-transcriptional modification process which is the major molecular mechanism that contributes to the protein diversity. It was found that the spliceosome, a large ribonucleoprotein, is the place where the RNA cleavage and ligation proceeds for the removal of non protein coding segments or introns. It requires five subunits, U1,U2, U4/U6 and U5, to form an active spliceosome. In short, during the transcription process, mRNA may include (enhance) or exclude (silent) one or multiple exons of a gene. Since every protein has at least two isoforms, the proteins listed below just provide some examples. G-actin: despite its conserved nature, it has a varying number of isoforms (at least six in mammals). UDP-glucuronosyltransferase, an enzyme superfamily responsible for the detoxification pathway of many drugs, environmental pollutants, and toxic endogenous compounds has 16 known isoforms encoded in the human genome. G6PDA: normal ratio of active isoforms in cells of any tissue is 1:1 shared with G6PDG. This is precisely the normal isoform ratio in hyperplasia. Only one of these isoforms is found during neoplasia. ↑ Smith, Lloyd M; Kelleher, Neil L; Linial, Michal; Goodlett, David; Langridge-Smith, Pat; Goo, Young Ah; Safford, George; Bonilla*, Leo; Kruppa, George. "Proteoform: a single term describing protein complexity". Nature Methods. 10 (3): 186–187. doi:10.1038/nmeth.2369. PMC 4114032 . PMID 23443629. ↑ Brett, D; Pospisil, H; Valcárcel, J; Reich, J; Bork, P (2002). "Alternative splicing and genome complexity". Nature Genetics. 30 (1): 29–30. doi:10.1038/ng803. PMID 11743582. ↑ Kozlowski, L.; Orlowski, J.; Bujnicki, J. M. (2012). "Structure Prediction for Alternatively Spliced Proteins". Alternative pre-mRNA Splicing. p. 582. doi:10.1002/9783527636778.ch54. ISBN 9783527636778. 1 2 Athena Andreadis; Maria E. Gallego; Nadal-Ginard, Bernardo (1987-01-01). "Generation of Protein Isoform Diversity by Alternative Splicing: Mechanistic and Biological Implications". Annual Review of Cell Biology. 3 (1): 207–242. doi:10.1146/annurev.cb.03.110187.001231. PMID 2891362. 1 2 3 4 R E Breitbart; A Andreadis; Nadal-Ginard, B. (1987-01-01). "Alternative Splicing: A Ubiquitous Mechanism for the Generation of Multiple Protein Isoforms from Single Genes". Annual Review of Biochemistry. 56 (1): 467–495. doi:10.1146/annurev.bi.56.070187.002343. PMID 3304142. 1 2 3 Dasgupta, Biplab; Chhipa, Rishi Raj (2016-03-01). "Evolving Lessons on the Complex Role of AMPK in Normal Physiology and Cancer". Trends in Pharmacological Sciences. 37 (3): 192–206. doi:10.1016/j.tips.2015.11.007. ISSN 0165-6147. PMC 4764394 . PMID 26711141. 1 2 3 4 5 Lee, Yeon; Rio, Donald C. (2015-01-01). "Mechanisms and Regulation of Alternative Pre-mRNA Splicing". Annual Review of Biochemistry. 84 (1): 291–323. doi:10.1146/annurev-biochem-060614-034316. PMC 4526142 . PMID 25784052. ↑ Barre L, Fournel-Gigleux S, Finel M, Netter P, Magdalou J, Ouzzine M (March 2007). "Substrate specificity of the human UDP-glucuronosyltransferase UGT2B4 and UGT2B7. Identification of a critical aromatic amino acid residue at position 33". FEBS J. 274 (5): 1256–64. doi:10.1111/j.1742-4658.2007.05670.x. PMID 17263731. Look up isoform in Wiktionary, the free dictionary.